Technology allows us to get what we want, when we want. This power has brought a new dimension to customer expectations and perceptions of brands. With a daily plethora of information, we are getting good at tuning out messages, being more elusive, more demanding, more impatient and definitely more discerning. We’re now living in the ‘customers are king’ era. Technology has also changed how we communicate. We build communities around the things that matter to us. As leading brands shift the benchmark for ‘customer experience’ ever higher, we align ourselves with those that make an emotional connection – with the brands that share our beliefs and that really ‘get me’. Brands that are genuinely authentic, passionate and lead through a value system that buyers connect with are the ones winning. You might think this only happens on a consumer level, but B2B buying is also highly emotive because of the level of personal risk buyers feel. A whitepaper compiled by CEB Marketing Research Council for Google, found personal value has twice the effect of business value across a broad range of commercial outcomes. Neuroscience tells us that decision-making isn’t logical – it’s emotional, because it sits in the brain where emotions are generated. People make decisions based on self-interest and what’s good for them (even if they don’t realise it!). Communicating the real drivers behind the decisions buyers make, instead of through rational logic and reason, is more effective and compelling. When a buyer hears an unequivocal truth, one that they typically need solving, it leads to a higher chance of engagement. Buyers choose brands that have helped them feel it’s to their advantage to do so. Plan2Brand helps you build a multi-dimensional, high definition window into your buyers world to help your product development and improve your marketing. Between brands who are setting the future stage for ‘customer experience’ and buyers who make no distinction when assessing your business, it’s never been more important to understand the reasons why they make the decisions they do. Wouldn’t you want to know why a prospect decided to buy, didn’t buy or just kept the status quo? When you know these things, you reveal insights into how they make decisions, why they make decisions and exactly what they are looking for in an offering like yours. You discover the tangible problems they need fixing to the intangible desires they wish fulfilled. Once you uncover these things, you can begin to work on how to get those missed opportunities, create better marketing messages, or reposition your product or service. As the branding wisdom goes, if you try to appeal to everyone, you’ll appeal to no one in particular. Spending your marketing budget on people that aren’t interested in the first place doesn’t make sense. Attempting to appeal with one message or piece of creative just won’t resonate. Even if you think you have a product or service that appeals to everyone, you still need to talk to them in a tailored way. Getting insightful information by listening to buyers helps you discover when and where to provide useful information as they make their decision to purchase or not. With marketing efforts focused on the people who are most likely to buy, your valuable resources are used in the best way possible. Plan2Brand helps you discover buying insights by listening and interpreting what buyers say. Plan2Brand shows you how to develop an insightful picture of your dream customers. Determining the most attractive target buyers, by researching and dissecting your market. Analysing and grouping buying insights into the 5 key areas that drive buyers decision-making. 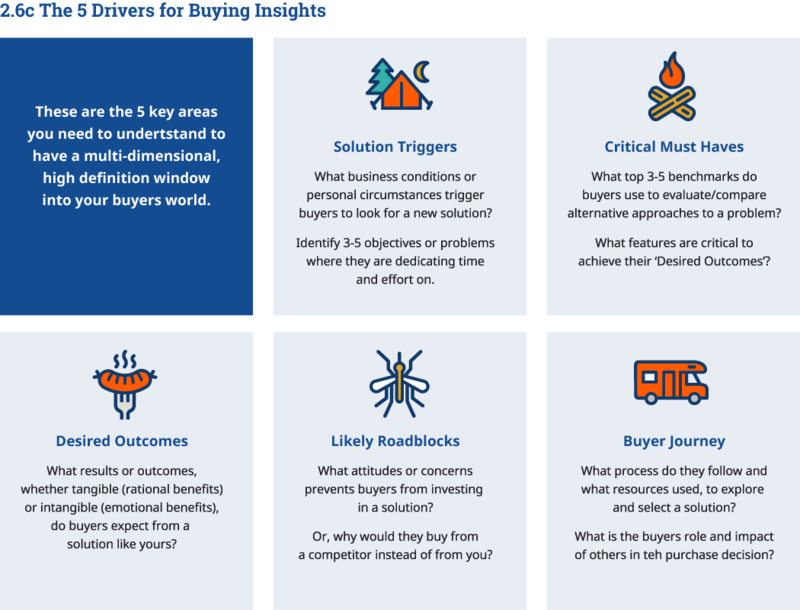 Using buying insights to create a Buyer Persona – a multi-layered view of your ideal buyers world. 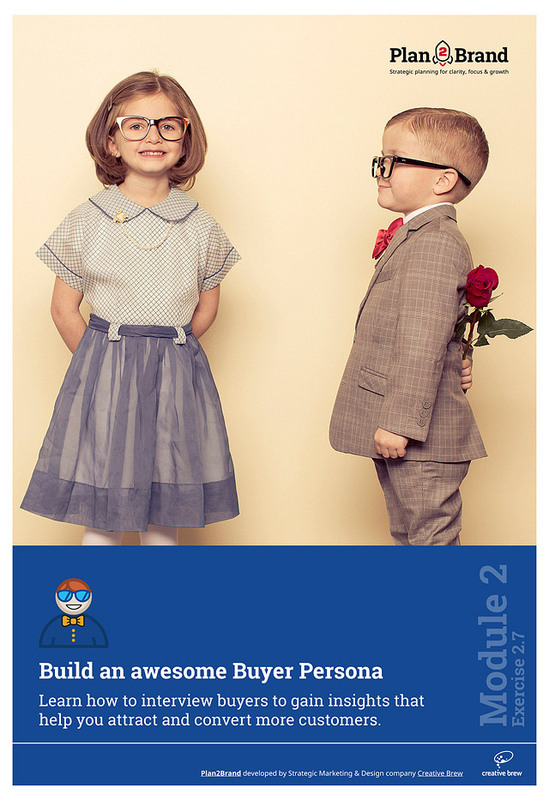 *You can develop buying insights for your Buyer Persona from your own knowledge and experience. To confirm your insights though, it’s highly recommended you interview buyers at some stage. Its comprehensive, logical, and most importantly it works. It’s like you are sitting down with your own brand strategy consultant, helping you work step by step through the process of building your brand.